Kathryn Ottolino-Perry, PhD1, Emilie Chamma, MSc1, Kristina M. Blackmore, MSc1, Liis Lindvere-Teene, MSc1, Danielle Starr MSc2, Kim Tapang, MD3, Bethany Pitcher, MSc4, Tony Panzarella, MSc4, Ron Linden, MD, CCFP3, Ralph S. DaCosta, PhD1,5,6. Presented at CAWC 2016. Proceedings of the Annual Canadian Association of Wound Care Conference; 2016 Nov 3-6, Niagara Falls, ON, Canada. 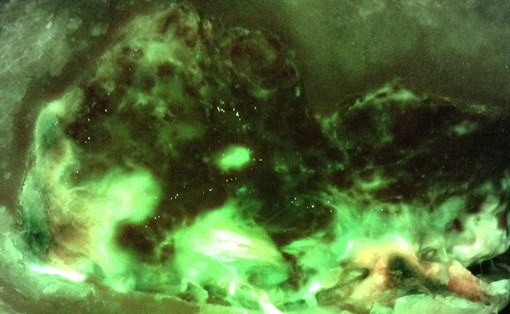 To compare the efficacy of standard clinical signs and symptoms (CSS) guided-Levine swabbing with autofluorescence (AF) imaging-guided swabbing to detect bacteria in diabetic foot ulcers. Twenty-nine participants with diabetic foot ulcers were recruited between December 2014 and February 2015. 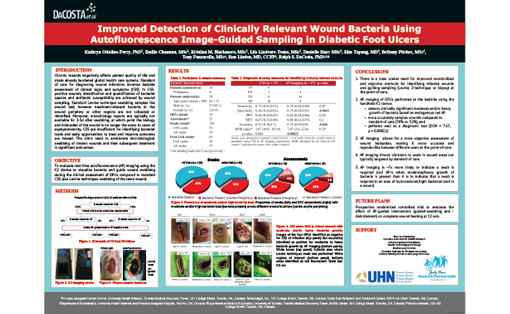 Diabetic foot ulcers (n=31) were evaluated for CSS by the treating clinician, as well as bacteria AF using a prototype handheld imaging device. Wounds were classified as positive or negative for infection based on CSS (CSS+/-) and AF (AF+/-), and swabs were collected by Levine-technique (in the wound centre) and AF-guidance. Standard semi-quantitative microbiological analysis was performed and wounds with moderate and/or heavy bacterial growth were classified as having a clinically relevant bacterial load. Diagnostic accuracy measures and diagnostic odds ratios were calculated for each sampling method and compared using marginal regression models. Participants were primarily male (91.3%) with a mean age of 64 ± 13.0 years. 55.2% (16/29) of participants were assessed at >1 visit. 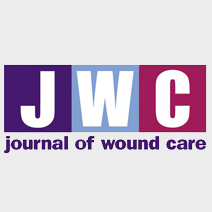 At initial visits, 44% (12/27) of wounds were positive for moderate and/or heavy bacteria growth by either method of swab collection, of which 83% (10/12) were positive for moderate and/or heavy bacteria growth in the wound periphery (9/10 were positive in the centre and periphery). 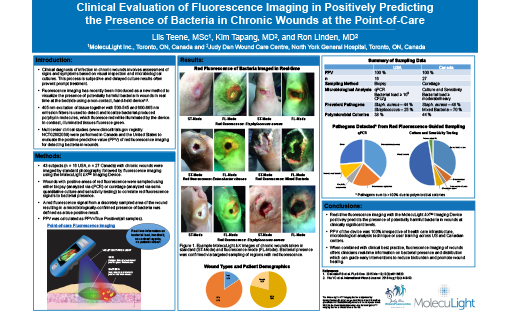 AF imaging more accurately identified the presence of moderate and/or heavy bacterial growth in wounds compared to standard CSS with Levine swabbing [accuracy 78% versus 52%, (p=0.048)] and resulted in a statistically significant adjusted diagnostic odds ratio (DOR) 7.67 (p<0.00022) versus the non-significant adjusted DOR (3.07, p=0.066) for CSS with Levine swabbing. Additionally, AF-image guided swabbing collected a greater diversity of bacterial species. 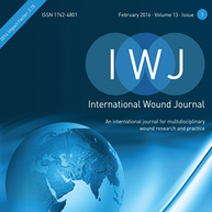 Standard clinical assessment of wound microbiology does not adequately sample all diagnostically relevant wound areas. As a result, wounds may be improperly identified as non-colonized or uninfected due to ineffective sampling and patients may not receive appropriate treatment. The problem is compounded in asymptomatic patients where bacterial load is conventionally assumed to be unremarkable. AF imaging can help clinicians better assess wounds in real time for areas of clinically significant bacteria (including beyond the wound bed) requiring sampling for cultures, and thus maximize the effectiveness of sampling of treatment-relevant pathogenic bacteria (incl. in asymptomatic patients). Targeted AF image-guiding sampling is easily integrated into routine clinical workflows and is compatible with biopsies. This new approach could improve the accuracy of diagnosis of infection at the point-of-care leading to more effective and personalized treatment plans. 1Princess Margaret Cancer Centre, University Health Network, Toronto, ON, Canada. 2MolecuLight Inc, Toronto, ON, Canada. 3Judy Dan Research and Treatment Centre, Toronto, ON, Canada. 4Department of Biostatistics, University Health Network and Princess Margaret Hospital, Toronto, ON, Canada. 5Department of Medical Biophysics, University of Toronto, Toronto, ON, Canada. 6Techna Institute, Toronto, ON, Canada.